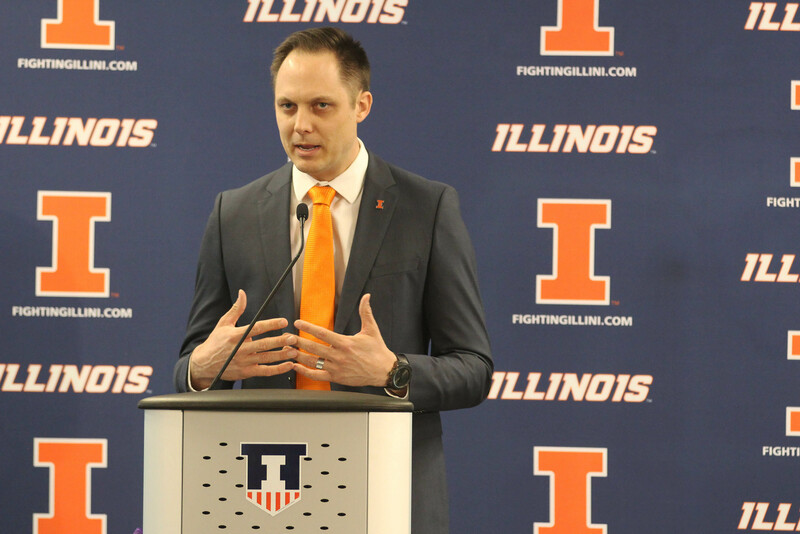 Chris Tamas talks to the press for the first time after being hired as Illinois’ new women’s volleyball head coach on Feb. 10. Four more recruits recently signed to play this season. The 2017 season will be the beginning of a new era for the Illinois volleyball team. Huff Hall will feature many new faces this fall: Nine freshmen and a new head coach move in after seven seniors and a head coach depart. The final four members of former head coach Kevin Hambly’s last recruiting class were announced last Wednesday. Setter Kylie Bruder and defensive specialists Morgan O’Brien, Lexie Smith and Emmaline Walters join middle blocker Tyanna Omazic and outsides Marijke Van Dyke, Emily Hollowell, Megan Cooney and Kylie Kuyava-DeBerg. The Illini needed a sizable recruiting class to fill the spaces left by the graduating seniors, and with the class of 2017, head coach Chris Tamas achieves that. The addition of these final four players changes the previously offense-minded class to look more balanced. Tamas said that he plans to give all of the new recruits chances to prove themselves but expects some growing pains as they adjust to the speed and skill of the college game. With the recruits, the Illinois roster grows to 18 total players, two more than are allowed to travel to road matches. Tamas isn’t worried about having to leave two of his players back though — in fact, he may leave even more behind when the team travels. The second part of the class could not be announced on signing day due to NCAA rules.